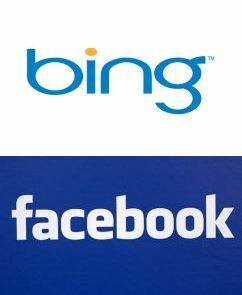 Seven months after Facebook and Microsoft announced they were working together to personalize Internet searches, Microsoft Corporation began letting its search engine Bing.com's results reveal the interests of people's friends at Facebook. "We're marrying fact-based search results with your friends' street smarts to combine the best data on the Web with the opinions of the people you trust the most and the collective IQ of the Web." Bing senior vice president Yusuf Mehdi said in a media release. Bing is already the standard Internet search engine for Facebook.com. Now, on Facebook, there is a "Bing bar" button which allows members to display a "Like" for any web visited by them. This information shared on Facebook via interests and "Likes" allows search engines to shape online searches to individuals and personalize results. Executives at Bing's competitor Google.com have also discussed about the importance of searches that are personalized and social. On Google.com, users have an option of viewing related links that have been retweeted by their Twitter contacts. Microsoft entered into an advertising partnership with Facebook in 2007. Microsoft also invested $240 million for a 1.6 percent stake in Facebook, at the time Facebook had only 100 employees and seven million members. Today Facebook has more than 500 million active users, with India having 25 million active members. "This is just the beginning; there is going to be a whole lot more to come over time," Facebook founder Mark Zuckerberg had said on the collaboration.